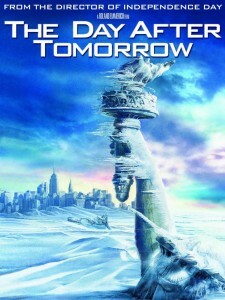 The Day After Tomorrow will not be spent worrying about storyline or nuanced characters. It will not be a day of reflection of plausibility or concern about logic. No. Like the inventor who builds an expensive contraption designed to perform simple tasks, The Day After Tomorrow is a flimsy premise that exists to justify expensive cgi. Considering the sudden and unexpected damage caused by the astonishingly rapid frozen advance, perhaps the chill could be dubbed Cyclone Trump. With weather so cold your taun-taun has no chance of survival only the famous can survive, with Dennis Quaid crossing inhospitable terrain to rescue son Sam (Jake Gyllenhaal), despite having no way of knowing if Sam, or anyone for that matter, survived the initial freeze or even stayed in the same location. The Day After Tomorrow is ridiculous, but strangely not ridiculous enough. In a world where buildings freeze instantly I need more stupid. A man trudging across ice to find his son won’t cut it. Without a genuine story, well realise characters or a protagonist, this is… well any Roland Emmerich film really, but even for him this is flimsy. Final Rating – 6 / 10. As Mr Freeze might say, “Ice to meet you”. This entry was posted in Film, Movie Reviews, The Grey Area. Bookmark the permalink.